For the administrative sudivision known as a banner, see Banners of Inner Mongolia. Ottoman Hungarian tughs captured by Ferdinand II, Archduke of Austria in 1556. A tug (Mongolian: туг [tʰʊɡ], Turkish: tuğ, Ottoman Turkish: طوغ‎ ṭuġ or توغ tuġ) or sulde (Mongolian: сүлд) is a pole with circularly arranged horse or yak tail hairs of varying colors arranged at the top. It was historically flown during the period of the Mongol Empire, and later adopted in derived Turco-Mongol and Turkic khanates and the Ottoman Empire. In the 17th century, it was also adopted by Slavic cavalry (cossacks, haidamaka), under the name bunchuk (Ukrainian: Бунчук; Polish: Buńczuk). It is still used by some units of the Polish military. A white-haired banner is used as a peacetime symbol, while the black banner was for wartime. Usage of the horse tail is symbolic because horses were central to the Mongols' livelihood. This is similar to the use of horse tail hairs for the morin khuur. The original white banner disappeared early in history, but the black one survived as the repository of Genghis Khan's soul. The Mongols continued to honor the banner, and Zanabazar (1635–1723) built a monastery with the special mission of flying and protecting the black banner in the 17th century. Around 1937, the black banner disappeared amidst the great purges of the nationalists, monks and intellectuals, and the destruction of monasteries. The Nine White banners came into renewed significance in Mongolia after democracy was adopted in the early 1990s as a symbol of the traditional Mongolian state, replacing the previous communist red flags. The state banner flown by the Mongols, the "Yesön Khölt tsagaan tug" (Mongolian: Есөн хөлт цагаан туг) or the "Nine Base White Banners", is composed of nine flag poles decorated with white horse tail hairs hanging from a round surface with a flame or trident-like shape on the top. The Nine White Banners was a peacetime emblem used exclusively by the Khans in front of their yurt. The central banner is larger in size than the rest and is placed in the center of the other eight. The modern Mongolian nine white banners are kept in the Government Palace in Ulaanbaatar. The "Dörvön khölt khar sulde" (Mongolian: Дөрвөн хөлт хар сүлд) or the "Four base black banners" was used in wartime. It is made of black horse tail hairs and flown in the same fashion. According to the illustrated Japanese chronicle Mōko Shūrai Ekotoba, the banner of the Mongolian Yuan fleet that invaded Japan was black. The modern Mongolian black banners are kept in the Ministry of Defense. 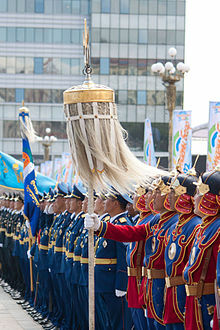 Within the Mongolian Armed Forces, the white tug is used as the finial in military colours' flagpoles. ^ Довідник з історії України. За ред. І. Підкови та Р. Шуста. — Київ: Генеза, 1993. Zdzislaw Zygulski, Ottoman Art in the Service of Empire, Hagop Kevorkian Series on Near Eastern Art & Civilization, New York University Press (1992). Wikimedia Commons has media related to Bunchuk. (in Ukrainian) Довідник з історії України. За ред. І. Підкови та Р. Шуста. — Київ: Генеза, 1993. This page was last edited on 20 March 2019, at 15:58 (UTC).